To become the complete player, you will need to look at all aspects of your game. 'Fitness' should be broadened from the stereotypical view of heart and lung capability or muscular strength to include the whole spectrum from your head - mental fitness - down to your toes - stretching, agility and footwork. 'The Complete Player' can be summarized in the following headings. In many respects, this category is one of the easier ones to improve. Set exercises are available and, through repetition, each of these can be improved upon. Speed is possibly the most important of these, especially for the singles player. Superior speed will allow you to reach shots early and to finish rallies quickly. Tip: Try a series of 10 x 10 metre sprints at full pace. Allow 2-3 minutes rest between each sprint. Warm down gently afterwards. Muscular strength is vital for an explosive game. This should be combined with a quality stretching regime before - and especially following - each training session or match. Stamina is important in order to maintain your performance level during a match. The higher the level at which you play, the more important this will become. Good stamina will allow you to carry on executing shots the way you need to and allow you to maintain mental focus as the game wears on. Apart from lengthy training sessions, this can be built up by interval training or simply making your normal sessions tougher, for example by adding ankle weights. Two of these, accuracy and consistency can be built up through practice. Repetition during routines in a closed environment followed by repetition under pressure will enhance and build these. Deception can be added through practice but there is an added factor of knowing when to play a shot and when not to. You will also have to have the confidence to execute the shot well. Keeping your opponent guessing will tire them out while buying you more time in the process. Of these, good footwork could be said to be the most valuable to the complete player. Good footwork will allow you to move efficiently, save energy, get to shots more quickly and to be in the right position (and posture) to play the right shot. There are many footwork drills available and the buzzwords 'fast feet' should give you a clue as to what you are aiming for. From simple skipping, a method favoured by boxers, to practicing shadow routines with correct movement, you can enhance this area of your game relatively easily. Reflexes vary from individual to individual but can be worked upon. Speed drills will sharpen up your game. Similarly, good technique will make sure your racket is in the right place. Taking the shuttle at the right time (usually as early as possible unless you are playing a dummy shot) will buy you time and reduce the time available to your opponent. Good technique is therefore an essential part of a great game. Tip: Try flat drives across the net with a partner. Move closer together to reduce reaction time and sharpen your reflexes. 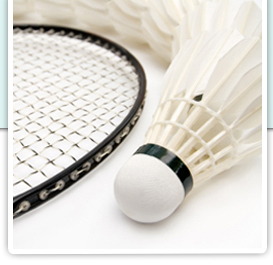 Badminton is not just played with the body but with the mind. Having the above skills will allow you to outthink your opponent. Anticipation comes with having the skills and knowledge to 'read the game'. Even a beginner can have good anticipation. This will improve by concentrating, spotting patterns in your opponents play and through knowing which shots to play. Like a good chess player, the best badminton players will be thinking ahead and planning their responses. This ties-in with analytical skill. Having the ability to analyse the game will allow you to adapt to conditions, changes in your opponents tactics and, correspondingly, any requirement to change your own game around. Remember - do not lose a game without knowing why. A great player has the aforementioned speed, strength and stamina. We have already touched on speed and stamina. Aside from playing, you can build your strength with a muscle group specific weight training regime. Some upper body strength is required in badminton, however over-training the upper body can result in carrying too much weight around the court. This will have an adverse effect on your speed and stamina. Work on your core muscles in the centre of your body. Core strength will increase the power you can produce in your shots and reduce fatigue. Pilates is excellent for this. Sit ups and other core strengthening exercises are very beneficial to badminton players. Good leg strength is vital. Squats and lunges replicate badminton movements. Prevent imbalance and build the antagonistic muscle group (the backs of your legs) with deadlifts. Weight training should be done under supervision unless you are an experienced athlete. Consult your doctor before taking on a new training program. Plyometric training is an excellent way of building explosive power. This involves bounding and leaping movements, much as you would use on a badminton court. Good form is important so carry out a small number of repetitions for each set and rest in between sets. The importance of stretching cannot be underestimated. Good flexibility will add range to your movement, power to your shots and help to protect you against injury. The views on stretching have changed recently with many studies showing that post-game stretching is as important, if not more so, than pre-game stretching. Moreover, you should use dynamic stretching as the primary type. That is to say your stretches should involve movement and, where possible mimic movement you will make during the game. This will increase blood flow and warm the relative muscle groups as well as preparing you mentally for the movements you will need. Tip: Avoid static stretching of cold muscles. This can actually damage your muscle and reduce power output. Isometric stretching can be used as part of an athlete's training program. There are some good books available on this. Isometric stretching should only be used by trained athletes and only with correct guidance.